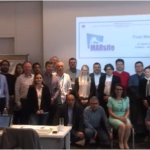 Video: Nurcan Meral Ozel, John Douglas, Louis Geli, Paolo Favali explain MARsite. MARSite has 11 Work Packages dealing with Management, Research and Develeopment, Data Integration and Dissemination acivities. The main objective of this WP is to ensure the successful completion of the project goals on time within the limits defined by the budgetary framework and quality standards imposed by the EU. This work package will oversee the administrative and financial management and it will ensure financial and scientific/technical coordination, project planning and evaluation of the project progress, while emphasizing quality assurance. The aim of WP2 is the collection and integration of seismological, geochemical, and geodetic data to detect and model the interactions between fluids, crustal deformation and ruptures of the active tectonic structures of the Marmara area and, thereby, to contribute to its seismic hazard assessment. In this WP, long-term continuous monitoring of the crustal deformation will be investigated by exploiting the existing geodetic crustal deformation monitoring systems. The main objective of this WP is to install a multi-parameter borehole system and surface array as closest as to the main Marmara Fault (MMF) in the western Marmara Sea, and measure continuously the evolution of the state of stress of the fault zone surrounding the MMF and to detect any anomaly or change which may occur before earthquakes by making use of the data from the arrays already running in the eastern part of the Marmara Sea. The main aim of this WP is to implement an integrated approach by harmonizing geodetic and seismic data to be used in early warning applications, such as fast centroid moment tensor inversion and rapid slip inversion. The 1999 Izmit and Duzce earthquakes in northwest Turkey have revealed the Ataköy area located westwards of Istanbul as affected by very significant local site effects (Sørensen et al., 2006). Moreover, the adjacent urbanized and geologically similar area of Cekmece has been geologically and geotechnically surveyed and characterized as a concentrated landslide prone area, showing high susceptibility to both landslide and liquefaction phenomena (Duman et al., 2005). The main task of the seismotectonics group is to establish the geography of the active fault system in the Sea of Marmara, its history of activity, both in terms of geologic time (since its origination in the medial Miocene) and historical time (past earthquake record). The objective of WP8 is to implement an integrated approach based on multiparameter seafloor observatories, to continuously monitor the micro-seismicity along with the fluid expulsion activity within the submerged fault zone. This WP has the objective of improving the existing earthquake early warning (EW) and rapid response (RR) systems in the Marmara Region (Istanbul) with the addition of a pilot landslide monitoring and EW system and introduction of new space technologies for monitoring and assessment of vulnerabilities. This work package concerns improving access to the wider community, outside the project consortium, of the data products and results of the project. This improved access concerns both dissemination of project results and conclusions to the general public and concerned stakeholders and also facilitating data access for the technical community. This workpackage concerns the dissemination of the project results to a wider community in general. The single task of this WP will be in charge of dissemination to the general public through, for example, printed brochures and the project website and also the development of dissemination materials to help in interactions with interested stakeholders in the Marmara Sea region, e.g. the Istanbul municipality.